Tidying up the taxonomy of the extant Booidea, including the erection and naming of two new families, the description of Acrantophis sloppi sp. nov., a new species of Ground Boa from Madagascar and Candoia aspera iansimpsoni, subsp. nov., a new subspecies of Boa from Papua New Guinea. ... Raymond T. Hoser, pp. 3-8. Further division of the genera Boiga Fitzinger, 1826 and Chrysopelea Boie, 1826, with the creation of a new tribe, a new genus and a new subgenus. ... Raymond T. Hoser, pp. 9-14. Making sense of the mess ... A new and workable sea-snake taxonomy with nomenclature to match! ... Raymond T. Hoser, pp. 15-18. The taxonomy of the snake genus Broghammerus Hoser, 2004 revisited, including the creation of a new subgenus for Broghammerus timoriensis (Peters, 1876). ... Raymond T. Hoser, 19-26. Adelynhoserserpenae wellsi, a new species of Jumping Pitviper from Mexico (Serpentes: Viperidae). ... Raymond T. Hoser, pp. 27-30. Divisions within the snake genera Cylindrophis Wagler, 1828 (Cylindrophiidae Fitzinger, 1843) and Anomochilus Berg, 1901 (Anomochilidae Cundall, Wallach and Rossman, 1993). ... Raymond T. Hoser, pp. 31-38. 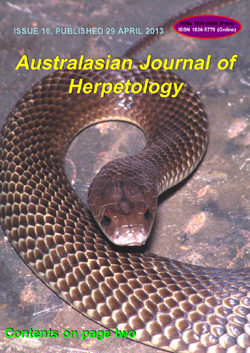 The description of new snake subgenera, species and subspecies from Australia (Squamata:Serpentes). ... Raymond T. Hoser, pp. 39-52. An updated taxonomy of the living Alligator Snapping Turtles (Macrochelys Gray, 1856), with descriptions of a new tribe, new species and new subspecies. ... Raymond T. Hoser, pp. 53-63.